The space policy of the United States includes both the making of space policy through the legislative process, and the implementation of that policy in the civilian and military US space programs through regulatory agencies. The early history of United States space policy is linked to the US–Soviet Space Race of the 1960s, which gave way to the Space Shuttle program. There is a current debate on the post-Space Shuttle future of the civilian space program. United States space policy is drafted by the Executive branch at the direction of the President of the United States, and submitted for approval and establishment of funding to the legislative process of the United States Congress. Space advocacy organizations may provide advice to the government and lobby for space goals. These include advocacy groups such as the Space Science Institute, National Space Society, and the Space Generation Advisory Council, the last of which among other things runs the annual Yuri's Night event; learned societies such as the American Astronomical Society and the American Astronautical Society; and policy organizations such as the National Academies. In drafting space policy, the President consults with the National Aeronautics and Space Administration (NASA), responsible for civilian and scientific space programs, and with the Department of Defense, responsible for military space activities, which include communications, reconnaissance, intelligence, mapping, and missile defense. The President is legally responsible for deciding which space activities fall under the civilian and military areas. The President also consults with the National Security Council, the Office of Science and Technology Policy, and the Office of Management and Budget. The 1958 National Aeronautics and Space Act, which created NASA, created a National Aeronautics and Space Council chaired by the President to help advise him, which included the Secretary of State, Secretary of Defense, NASA Administrator, Chairman of the Atomic Energy Commission, plus up to one member of the federal government, and up to three private individuals "eminent in science, engineering, technology, education, administration, or public affairs" appointed by the President. Before taking office as President, John F. Kennedy persuaded Congress to amend the Act to allow him to set the precedent of delegating chairmanship of this council to his Vice President (Lyndon B. Johnson). The Council was discontinued in 1973 during the presidency of Richard M. Nixon. In 1989, President George H. W. Bush re-established a differently constituted National Space Council by executive order, which was discontinued in 1993 by President Bill Clinton. President Donald Trump reestablished the Council by executive order in 2017.
International aspects of US space policy may involve diplomatic negotiation with other countries, such as the 1967 Outer Space Treaty. In these cases, the President negotiates and signs the treaty on behalf of the United States according to his constitutional authority, then presents it to the Congress for ratification. Once a request is submitted, the Congress exercises due diligence to approve the policy and authorize a budgetary expenditure for its implementation. In support of this, civilian policies are reviewed by the House Subcommittee on Space and Aeronautics and the Senate Subcommittee on Science and Space. These committees may exercise oversight of NASA's implementation of established space policies, monitoring progress of large space programs such as the Apollo program, and in special cases such as serious space accidents like the Apollo 1 fire, where Congress oversees NASA's investigation of the accident. Military policies are reviewed and overseen by the House Subcommittee on Strategic Forces and the Senate Subcommittee on Strategic Forces, as well as the House Permanent Select Committee on Intelligence and the Senate Select Committee on Intelligence. The Senate Foreign Relations Committee conducts hearings on proposed space treaties, and the various appropriations committees have power over the budgets for space-related agencies. Space policy efforts are supported by Congressional agencies such as the Congressional Research Service and, until it was disbanded in 1995, the Office of Technology Assessment, as well as the Congressional Budget Office and Government Accountability Office. Congress' final space policy product is, in the case of domestic policy a bill explicitly stating the policy objectives and the budget appropriation for their implementation to be submitted to the President for signature into law, or else a ratified treaty with other nations. Civilian space activities have traditionally been implemented exclusively by NASA, but the nation is transitioning into a model where more activities are implemented by private companies under NASA's advisement and launch site support. In addition, the Department of Commerce's National Oceanic and Atmospheric Administration operates various services with space components, such as the Landsat program. Military space activities are implemented by the Air Force Space Command, Naval Space Command, and Army Space and Missile Defense Command. Any activities "which are intended to conduct in the United States a launch of a launch vehicle, operation of a launch or re-entry site, re-entry of a re-entry vehicle" needs a license to operate in outer space. This license needs to by applied for by "any citizen of or entity organized under the laws of the United States, as well as other entities, as defined by space-related regulations, which are intended to conduct in the United States… should obtain a license form the Secretary of Transportation" compliance is monitored by the FAA, FCC and the Secretary of Commerce. The research and development budget in the Obama administration's federal budget proposal for fiscal year 2011. Funding for space programs occurs through the federal budget process, where it is mainly considered to be part of the nation's science policy. In the Obama administration's budget request for fiscal year 2011, NASA would receive $11.0 billion, out of a total research and development budget of $148.1 billion. Other space activities are funded out of the research and development budget of the Department of Defense, and from the budgets of the other regulatory agencies involved with space issues. The United States is a party to four of the five space law treaties ratified by the United Nations Committee on the Peaceful Uses of Outer Space. The United States has ratified the Outer Space Treaty, Rescue Agreement, Space Liability Convention, and the Registration Convention, but not the Moon Treaty. The five treaties and agreements of international space law cover "non-appropriation of outer space by any one country, arms control, the freedom of exploration, liability for damage caused by space objects, the safety and rescue of spacecraft and astronauts, the prevention of harmful interference with space activities and the environment, the notification and registration of space activities, scientific investigation and the exploitation of natural resources in outer space and the settlement of disputes." All space exploration will be done with good intentions and is equally open to all States that comply with international law. No one nation may claim ownership of outer space or any celestial body. Activities carried out in space must abide by the international law and the nations undergoing these said activities must accept responsibility for the governmental or non-governmental agency involved. Objects launched into space are subject to their nation of belonging, including people. Objects, parts, and components discovered outside the jurisdiction of a nation will be returned upon identification. If a nation launches an object into space, they are responsible for any damages that occur internationally. President Dwight Eisenhower was skeptical about human spaceflight, but sought to advance the commercial and military applications of satellite technology. Prior to the Soviet Union's launch of Sputnik 1, Eisenhower had already authorized Project Vanguard, a scientific satellite program associated with the International Geophysical Year. As a supporter of small government, he sought to avoid a space race which would require an expensive bureaucracy to conduct, and was surprised by, and sought to downplay, the public response to the Soviet launch of Sputnik. In an effort to prevent similar technological surprises by the Soviets, Eisenhower authorized the creation in 1958 of the Defense Advanced Research Projects Agency (DARPA), responsible for the development of advanced military technologies. Later in 1958, Eisenhower asked Congress to create an agency for civilian control of non-military space activities. At the suggestion of Eisenhower's science advisor James R. Killian, the drafted bill called for creation of the new agency out of the National Advisory Committee for Aeronautics. The result was the National Aeronautics and Space Act passed in July 1958, which created the National Aeronautics and Space Administration (NASA). Eisenhower appointed T. Keith Glennan as NASA's first Administrator, with the last NACA Director Hugh Dryden serving as his Deputy. NASA as created in the act passed by Congress was substantially stronger than the Eisenhower administration's original proposal. NASA took over the space technology research started by DARPA. NASA also took over the US manned satellite program, Man In Space Soonest, from the Air Force, as Project Mercury. 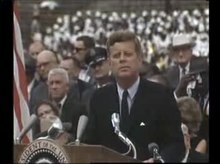 President Kennedy's speech at Rice University on September 12, 1962, famous for the quote "We choose to go to the Moon in this decade and do the other things, not because they are easy, but because they are hard." (17 mins 47 secs). Early in John F. Kennedy's presidency, he was inclined to dismantle plans for the Apollo program, which he had opposed as a senator, but postponed any decision out of deference to his vice president whom he had appointed chairman of the National Advisory Space Council and who strongly supported NASA due to its Texas location. This changed with his January 1961 State of the Union address, when he suggested international cooperation in space. In response to the flight of Yuri Gagarin as the first man in space, Kennedy in 1961 committed the United States to landing a man on the Moon by the end of the decade. At the time, the administration believed that the Soviet Union would be able to land a man on the Moon by 1967, and Kennedy saw an American Moon landing as critical to the nation's global prestige and status. His pick for NASA administrator, James E. Webb, however pursued a broader program incorporating space applications such as weather and communications satellites. During this time the Department of Defense pursued military space applications such as the Dyna-Soar spaceplane program and the Manned Orbiting Laboratory. Kennedy also had elevated the status of the National Advisory Space Council by assigning the Vice President as its chair. President Lyndon Johnson was committed to space efforts, and as Senate majority leader and Vice President, he had contributed much to setting up the organizational infrastructure for the space program. However, the costs of the Vietnam War and the programs of the Great Society forced cuts to NASA's budget as early as 1965. However, the Apollo 8 mission carrying the first men into lunar orbit occurred just before the end of his term in 1968. 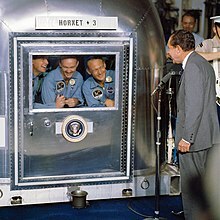 President Nixon visits the Apollo 11 astronauts in quarantine after observing their landing in the ocean from the deck of the aircraft carrier USS Hornet. Apollo 11, the first Moon landing, occurred early in Richard Nixon's presidency, but NASA's budget continued to decline and three of the planned Apollo Moon landings were cancelled. The Nixon administration approved the beginning of the Space Shuttle program, but did not support funding of other projects such as a Mars landing, colonization of the Moon, or a permanent space station. On January 5, 1972, Nixon approved the development of NASA's Space Shuttle program, a decision that profoundly influenced American efforts to explore and develop space for several decades thereafter. Under the Nixon administration, however, NASA's budget declined. NASA Administrator Thomas O. Paine was drawing up ambitious plans for the establishment of a permanent base on the Moon by the end of the 1970s and the launch of a manned expedition to Mars as early as 1981. Nixon, however, rejected this proposal. On May 24, 1972, Nixon approved a five-year cooperative program between NASA and the Soviet space program, which would culminate in the Apollo-Soyuz Test Project, a joint-mission of an American Apollo and a Soviet Soyuz spacecraft, during Gerald Ford's presidency in 1975. Space policy had little momentum during the presidency of Gerald Ford. NASA funding improved somewhat, the Apollo–Soyuz Test Project occurred and the Shuttle program continued, and the Office of Science and Technology Policy was formed. The Jimmy Carter administration was also fairly inactive on space issues, stating that it was "neither feasible nor necessary" to commit to an Apollo-style space program, and his space policy included only limited, short-range goals. With regard to military space policy, the Carter space policy stated, without much specification in the unclassified version, that "The United States will pursue Activities in space in support of its right of self-defense." President Reagan delivering the March 23, 1983 speech initiating the Strategic Defense Initiative. The first flight of the Space Shuttle occurred in April 1981, early in President Ronald Reagan's first term. Reagan in 1982 announced a renewed active space effort, which included initiatives such as privatization of the Landsat program, a new commercialization policy for NASA, the construction of Space Station Freedom, and the military Strategic Defense Initiative. Late in his term as president, Reagan sought to increase NASA's budget by 30 percent. However, many of these initiatives would not be completed as planned. The January 1986 Space Shuttle Challenger disaster led to the Rogers Commission Report on the causes of the disaster, and the National Commission on Space report and Ride Report on the future of the national space program. President George H. W. Bush continued to support space development, announcing the bold Space Exploration Initiative, and ordering a 20 percent increase in NASA's budget in a tight budget era. The Bush administration also commissioned another report on the future of NASA, the Advisory Committee on the Future of the United States Space Program, also known as the Augustine Report. During the Clinton administration, Space Shuttle flights continued, and the construction of the International Space Station began. The Clinton administration's National Space Policy (Presidential Decision Directive/NSC-49/NSTC-8) was released on September 14, 1996. Clinton's top goals were to "enhance knowledge of the Earth, the solar system and the universe through human and robotic exploration" and to "strengthen and maintain the national security of the United States." The Clinton space policy, like the space policies of Carter and Reagan, also stated that "The United States will conduct those space activities necessary for national security." These activities included "providing support for the United States' inherent right of self-defense and our defense commitments to allies and friends; deterring, warning, and if necessary, defending against enemy attack; assuring that hostile forces cannot prevent our own use of space; and countering, if necessary, space systems and services used for hostile purposes." The Clinton policy also said the United States would develop and operate "space control capabilities to ensure freedom of action in space" only when such steps would be "consistent with treaty obligations." The launch of the Ares I-X prototype on October 28, 2009 was the only flight performed under the Bush administration's Constellation program. To this end, the President's Commission on Implementation of United States Space Exploration Policy was formed by President Bush on January 27, 2004. Its final report was submitted on June 4, 2004. This led to the NASA Exploration Systems Architecture Study in mid-2005, which developed technical plans for carrying out the programs specified in the Vision for Space Exploration. This led to the beginning of execution of Constellation program, including the Orion crew module, the Altair lunar lander, and the Ares I and Ares V rockets. The Ares I-X mission, a test launch of a prototype Ares I rocket, was successfully completed in October 2009. A new National Space Policy was released on August 31, 2006 that established overarching national policy that governs the conduct of U.S. space activities. The document, the first full revision of overall space policy in 10 years, emphasized security issues, encouraged private enterprise in space, and characterized the role of U.S. space diplomacy largely in terms of persuading other nations to support U.S. policy. The United States National Security Council said in written comments that an update was needed to "reflect the fact that space has become an even more important component of U.S. Economic security, National security, and homeland security." The Bush policy accepted current international agreements, but stated that it "rejects any limitations on the fundamental right of the United States to operate in and acquire data from space," and that "The United States will oppose the development of new legal regimes or other restrictions that seek to prohibit or limit U.S. access to or use of space." President Barack Obama announces his administration's space policy at the Kennedy Space Center on April 15, 2010. The Obama administration commissioned the Review of United States Human Space Flight Plans Committee in 2009 to review the human spaceflight plans of the United States and to ensure the nation is on "a vigorous and sustainable path to achieving its boldest aspirations in space," covering human spaceflight options after the time NASA plans to retire the Space Shuttle. On April 15, 2010, President Obama spoke at the Kennedy Space Center announcing the administration's plans for NASA. None of the 3 plans outlined in the Committee's final report were completely selected. The President cancelled the Constellation program and rejected immediate plans to return to the Moon on the premise that the current plan had become nonviable. He instead promised $6 billion in additional funding and called for development of a new heavy lift rocket program to be ready for construction by 2015 with manned missions to Mars orbit by the mid-2030s. The Obama administration released its new formal space policy on June 28, 2010, in which it also reversed the Bush policy's rejection of international agreements to curb the militarization of space, saying that it would "consider proposals and concepts for arms control measures if they are equitable, effectively verifiable and enhance the national security of the United States and its allies." The NASA Authorization Act of 2010, passed on October 11, 2010, enacted many of these space policy goals. President Trump signs an executive order re-establishing the National Space Council, with astronauts Dave Wolf and Al Drew, and Apollo 11 astronaut Buzz Aldrin (left-to-right) looking on. 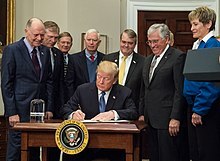 President Trump signs Space Policy Directive 1 on December 11, 2017, with astronauts Harrison Schmidt, Buzz Aldrin, Peggy Whitson, and Christina Koch looking on. On June 30, 2017, President Donald Trump signed an executive order to re-establish the National Space Council, chaired by Vice President Mike Pence. The Trump administration's first budget request keeps Obama-era human spaceflight programs in place: commercial spacecraft to ferry astronauts to and from the International Space Station, the government-owned Space Launch System, and the Orion crew capsule for deep space missions, while reducing Earth science research and calling for the elimination of NASA's education office. On December 11, 2017, President Trump signed Space Policy Directive 1, a change in national space policy that provides for a U.S.-led, integrated program with private sector partners for a human return to the Moon, followed by missions to Mars and beyond. The policy calls for the NASA administrator to "lead an innovative and sustainable program of exploration with commercial and international partners to enable human expansion across the solar system and to bring back to Earth new knowledge and opportunities." The effort will more effectively organize government, private industry, and international efforts toward returning humans on the Moon, and will lay the foundation that will eventually enable human exploration of Mars. The President stated "The directive I am signing today will refocus America's space program on human exploration and discovery." "It marks a first step in returning American astronauts to the Moon for the first time since 1972, for long-term exploration and use. This time, we will not only plant our flag and leave our footprints -- we will establish a foundation for an eventual mission to Mars, and perhaps someday, to many worlds beyond." "Under President Trump's leadership, America will lead in space once again on all fronts," said Vice President Pence. "As the President has said, space is the 'next great American frontier' – and it is our duty – and our destiny – to settle that frontier with American leadership, courage, and values. The signing of this new directive is yet another promise kept by President Trump." Among other dignitaries on hand for the signing, were NASA astronauts Sen. Harrison "Jack" Schmitt, Buzz Aldrin, Peggy Whitson, and Christina Koch. Schmitt landed on the Moon 45 years to the minute that the policy directive was signed as part of NASA's Apollo 17 mission, and is the most recent living person to have set foot on our lunar neighbor. Aldrin was the second person to walk on the Moon during the Apollo 11 mission. Whitson spoke to the president from space in April aboard the International Space Station and while flying back home after breaking the record for most time in space by a U.S. astronaut in September. Koch is a member of NASA's astronaut class of 2013. ^ a b Goldman, pp. 91–97. ^ National Aeronautics and Space Act (1958), Sec. 102(b). ^ Goldman, Nathan C. (1992). Space Policy:An Introduction. Ames, IA: Iowa State University Press. pp. 79–83. ISBN 0-8138-1024-8. ^ National Aeronautics and Space Act (1958), Sec. 201. ^ a b Spaceflight Now, "Trump signs order reviving long-dormant National Space Council"
^ a b Clemins, Patrick J. "Introduction to the Federal Budget" (PDF). American Association for the Advancement of Science. Archived from the original (PDF) on January 13, 2011. Retrieved February 8, 2011. ^ "OOSA Treaty Database". United Nations Office for Outer Space Affairs. Retrieved February 8, 2011. ^ United Nations Office for Outer Space Affairs (Feb 16, 2011). "United Nations Treaties and Principles on Space Law". Retrieved February 16, 2011. ^ a b c d e f g h i Goldman, pp. 84–90. ^ Dwight D. Eisenhower and Science & Technology, (2008).Dwight D. Eisenhower Memorial Commission, Source Archived December 16, 2010, at the Wayback Machine. ^ Kenney, Charles (2000). John F. Kennedy: The Presidential Portfolio. pp. 115–116. ^ Reeves, Richard (1993). President Kennedy: Profile of Power. p. 138. ^ Black, Conrad (2007). Richard M. Nixon: A life in Full. New York, NY: PublicAffairs Books. pp. 615–616. ISBN 1-58648-519-9. ^ "The Statement by President Nixon, January 5, 1972". NASA History Office. January 5, 1972. Retrieved November 9, 2008. President Richard M. Nixon and NASA Administrator James C. Fletcher announced the Space Shuttle program had received final approval in San Clemente, California, on January 5, 1972. ^ Butrica, Andrew J. (1998). "Chapter 11 – Voyager: The Grand Tour of Big Science". From Engineering Science to Big Science. The NASA History Series. Washington, D.C.: NASA History Office. p. 256. Retrieved November 9, 2008. The Bureau of Budget under Nixon consistently reduced NASA's budget allocation. ^ Handlin, Daniel (November 28, 2005). "Just another Apollo? Part two". The Space Review. Retrieved November 9, 2008. ^ "The Partnership – ch6-11". Hq.nasa.gov. Retrieved June 17, 2010. ^ Presidential Directive/NSC-37, "National Space Policy," May 11, 1978. ^ Warren E. Leary (July 17, 1990). "White House Orders Review of NASA Goals". The New York Times. Retrieved June 23, 2009. ^ a b c Kaufman, Marc (October 18, 2006). "Bush Sets Defense As Space Priority". The Washington Post. Retrieved March 21, 2011. ^ "The Vision for Space Exploration" (PDF). NASA. February 2004. Retrieved December 5, 2009. ^ A Journey to Inspire, Innovate, and Discover – (PDF) The Full Report, submitted June 4, 2004. URL Retrieved September 4, 2006. ^ a b BROAD, WILLIAM J.; CHANG, KENNETH (28 June 2010). "Obama Reverses Bush's Space Policy". The New York Times. Retrieved 5 August 2018. ^ "U.S. Announces Review of Human Space Flight Plans" (PDF). Office of Science and Technology Policy. May 7, 2009. Retrieved September 9, 2009. ^ "NASA launches another Web site". United Press International. June 8, 2009. Retrieved September 9, 2009. ^ Bonilla, Dennis (September 8, 2009). "Review of U.S. Human Space Flight Plans Committee". NASA. Retrieved September 9, 2009. ^ Review of U.S. Human Space Flight Plans Committee; Augustine; Austin; Chyba; et al. "Seeking A Human Spaceflight Program Worthy of A Great Nation" (PDF). Final Report. NASA. Retrieved April 15, 2010. ^ "President Barack Obama on Space Exploration in the 21st Century". Nasa.gov.